Is Sennheiser still king of the headphones? Whenever we plug in a new headset to review here on TechRadar, we inevitably end up using Sennheiser's PC 350 or PC 161 as one of the key comparisons for what a high-end set of headphones designed for gaming should sound like. This much-loved pair are getting on a bit now, though, and a complete range refresh from Sennheiser just arrived in the office. Will our well-used reference kit finally get put to one side? The PC 333D isn't a direct replacement for the PC 350 – for that you'll want the more costly PC 360s – but it is priced more or less identically to the outgoing favourites. It's a lighter-weight kit, with smaller drivers and a more plasticky feel. 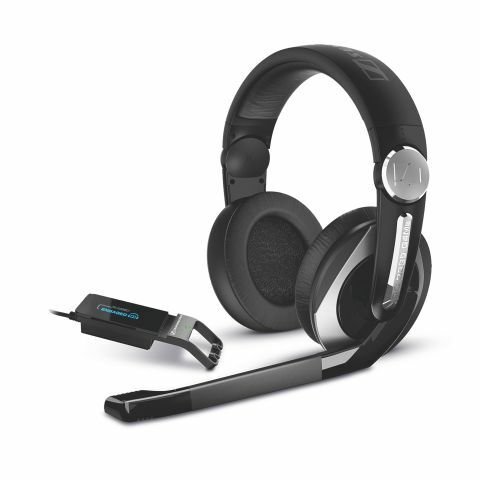 While the build quality may not feel quite like a £100 headset, it's tough and there are a few features designed specifically for gaming. The volume control is built into the right-hand earpiece for quick access, for example, and the mic mutes itself when you push the boom up. The most impressive part of the whole package is, as it should be, the audio characteristics of the speakers themselves. A massive 14 – 22,000Hz frequency range suggests that this is no ordinary set of cans.